Transport to, from and within our campuses is fundamental to providing staff, students and visitors with an experience of the University that supports our aspiration of being world-class. Furthermore, the potential environmental impact of transport associated with the University is very large given that we have about 64,000 enrolled students and 7,000 full-time equivalent staff. 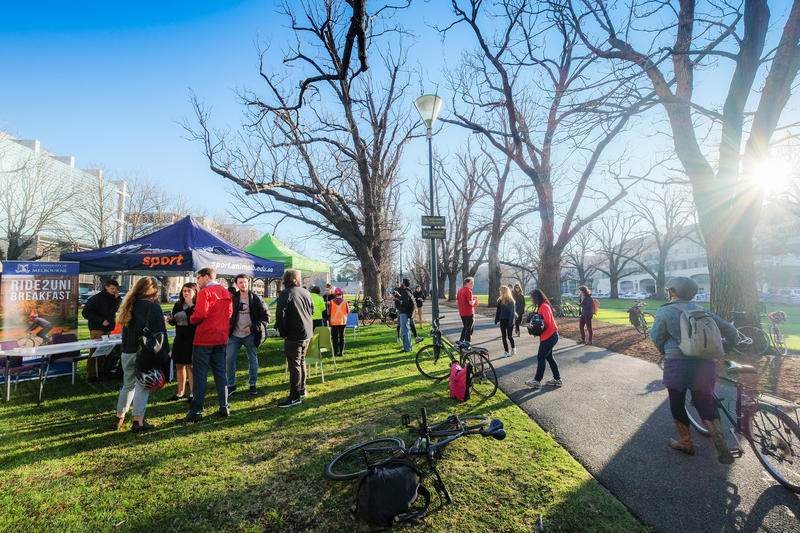 We are currently developing a University-wide sustainable transport strategy to reduce our environmental impact and optimise the unique University of Melbourne experience at our campus locations across Melbourne and regional Victoria. Gather comprehensive data about the transport behaviours and impacts of staff, students and visitors at all of the University’s campuses. This includes using surveys, collating existing information and drawing on a network of relevant staff and students. Collate, communicate and celebrate the broad range of sustainable transport activity already occurring across the University. This includes Ride2Uni breakfasts, UMSU Bike Co-op workshops, cyclist facilities, and Myki Commuter club, amongst many others. Exploit windows of opportunity created by existing and planned projects to achieve better transport outcomes. This includes campus planning and major projects such as the Melbourne Metro Project, New Student Precinct, and Werribee Campus Redevelopment.